New Grange is where the core to my soul lies which branches out to enfold all of Ireland. Thank you so much for sharing your thoughts about the homeland that millions of us call home. It's my absolute pleasure Katherine. Thank you and blessings of the solstice to you. I love listening to you weave magic, my friend. I hope to return again soon. Thank you. It's very rewarding for me, particularly when I get this warm feedback. Happy solstice. Beautifully said. Wish I was there at this magical time. Thank you for getting me there in spirit. 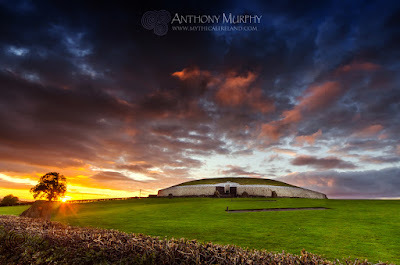 One of the things I love about what I do is that it helps bring people to Ireland in a way, especially people who feel connected to the place whether by ancestry or spiritually - in fact any way. Blessings of solstice to you and all yours. Very happy to help facilitate you being here in spirit. And thanks for the nice words. I hope you have a lovely solstice season. Anthony. Oh Eriu, let me lay in your arms there and breathe the air. Oh yes!! It's magical Michael. Just magical. Thanks so much for those moving words. On hearing them I felt the same tingles and deep emotions of belonging when I visit Bru na Boinne and am present in the chamber, especially my first experience about 10 years or so ago.